In our last update, the Happy Camper got a healthy dose of power courtesy of the folks at Aeromotive, MSD, Bowler Transmissions, and Wegner Automotive. 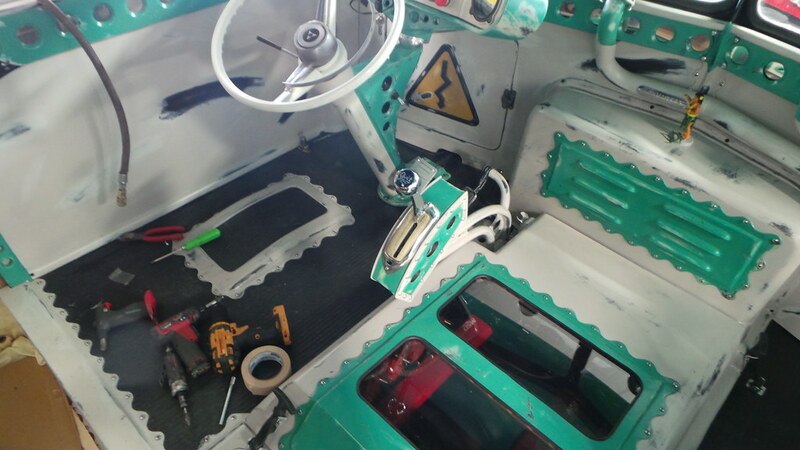 Now that it had the basics of what was needed to move under its own power, it was time to start working on the interior. 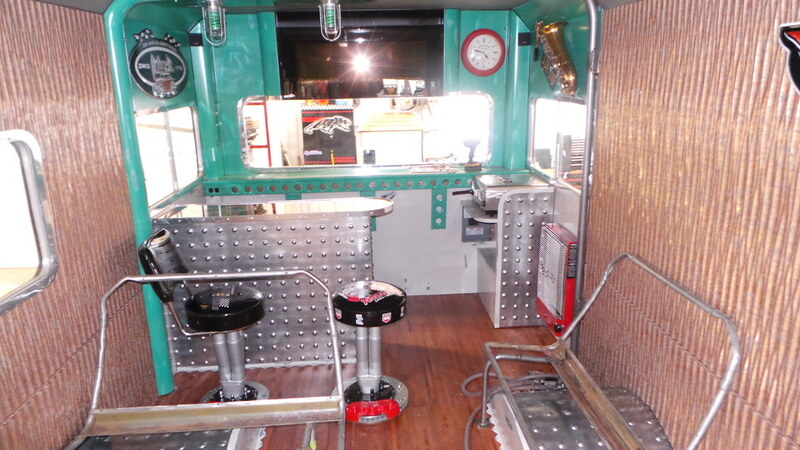 Our design idea for the cab portion of the RV was to sytle it in a very industrial way that was slightly reminiscent of a WWII bomber or military vehicle. 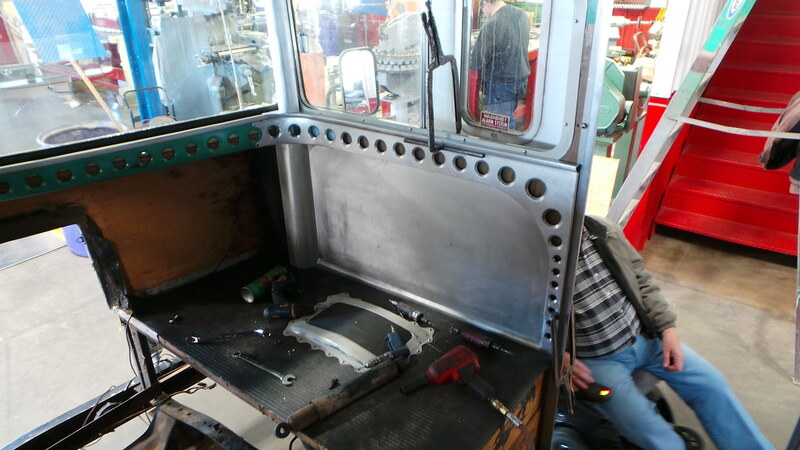 We fabricated all of the panels and continued the "lightening hole" patern from the gauge cluster support in the metal panels and would continue throughout the RV. 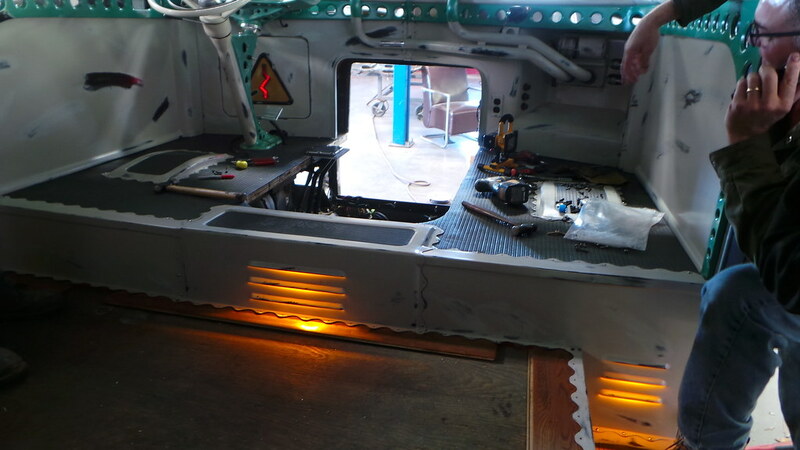 We then turned our attention to the floor of the cab, fabricating, painting, and distressing all new panes and adding vents with recessed lighting for even more accenting and to continue the industrial look/feel. 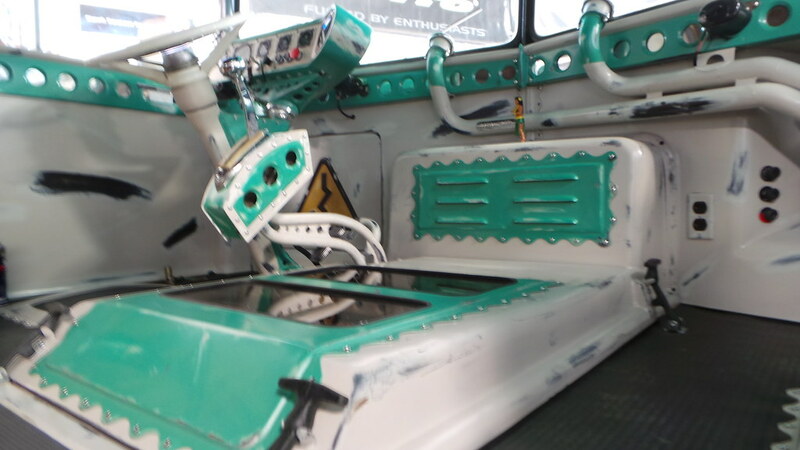 Also, behind the steering column, you will see even the electrical access panel gets a custom touch with a lit "electricity warning" sign. Next we turned our attention to the door. 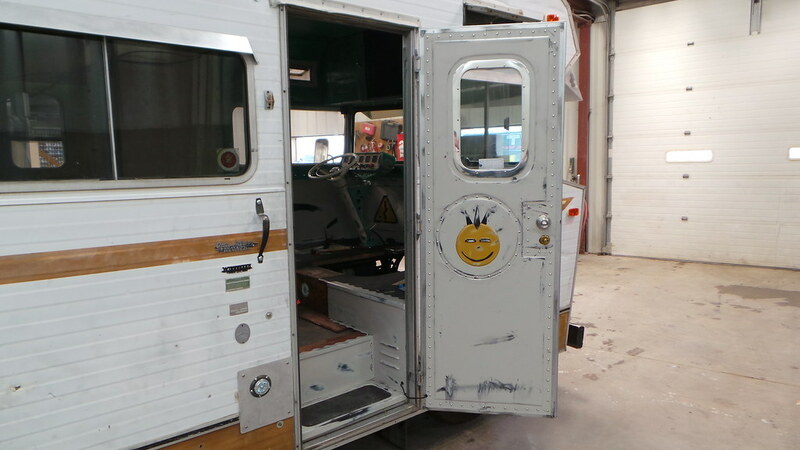 This would be the first glimpse that people would have of the interior of the Happy Camper and we wanted to make sure that it immediately communicated that this was no ordinary RV. 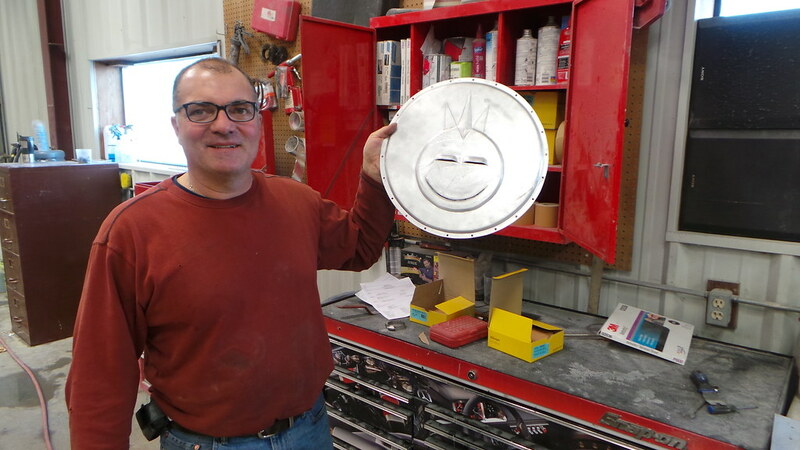 We crafted an all new sheet metal door skin as well as the Winnie's mascot, and namesake, the Happy Camper. After painting and distressing these new pieces, we installed them onto the door, but not before hiding lights behind the Happy Camper's eyes. Afterall, what fun would it be if it didn't light up. 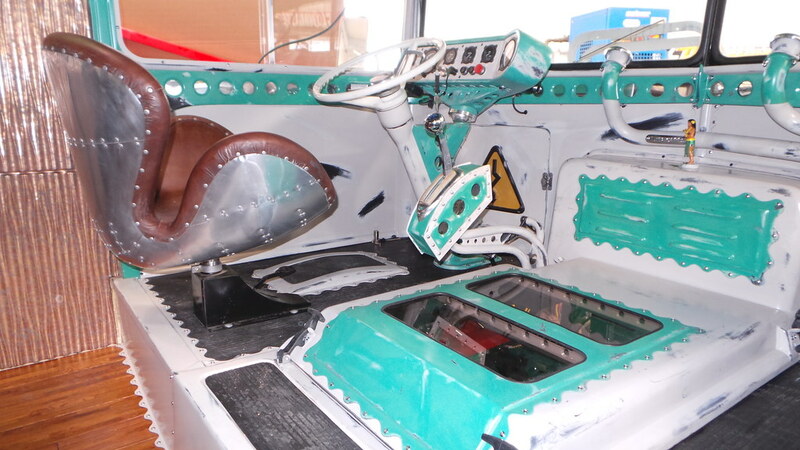 After reskinning the door, we started on the finishing details of the cab/cockpit. 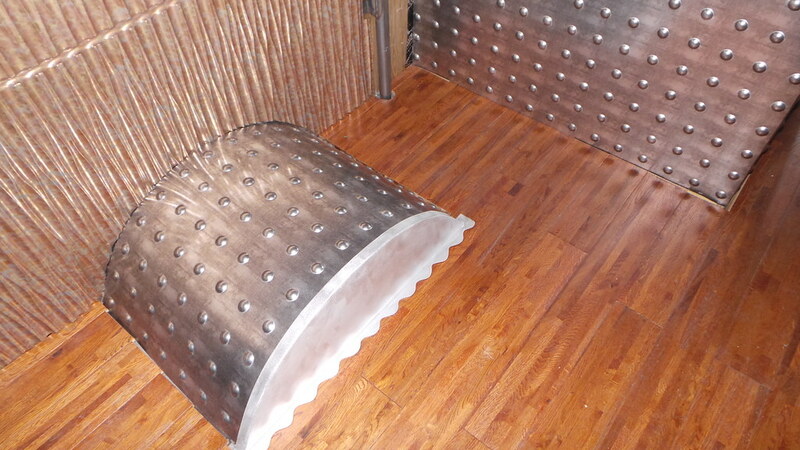 We fabricated a set of locker doors to use as cabinet doors and installed them on either side of the flat screen TV. 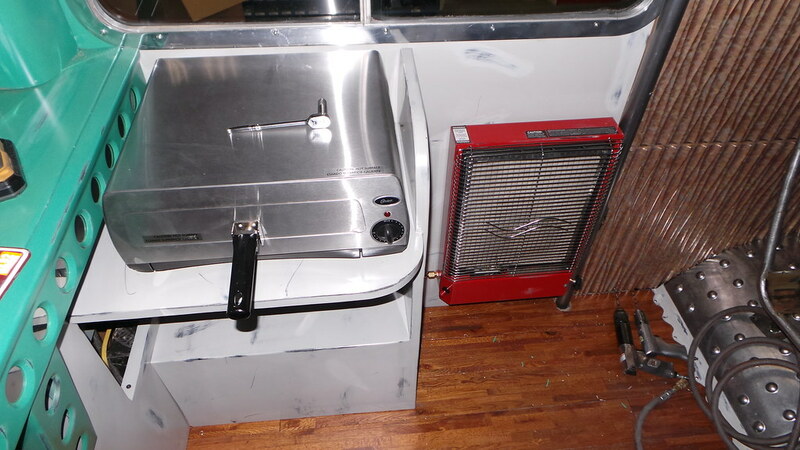 These cabinets would later contain the complete home theater system, because what good is a party RV without a super loud stereo and huge high-def TV? 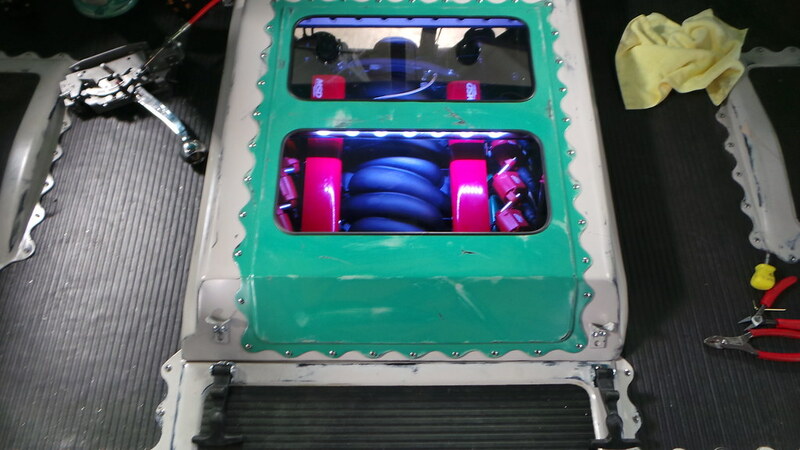 We also decided that our new Wegner Automotive LS engine with MSD EFI and Ignition was just too good looking to cover up, so we made this new engine cover with plexiglass windows and built-in lighting to show off the jewel that would propel our camper down the highway. 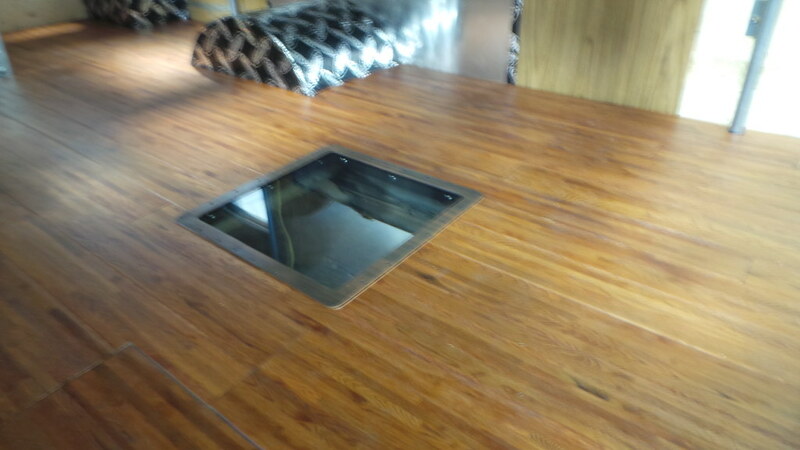 But the plexiglass windows didn't stop at just the engine cover, we also installed a large window in the middle of the floor of the coach. But why? 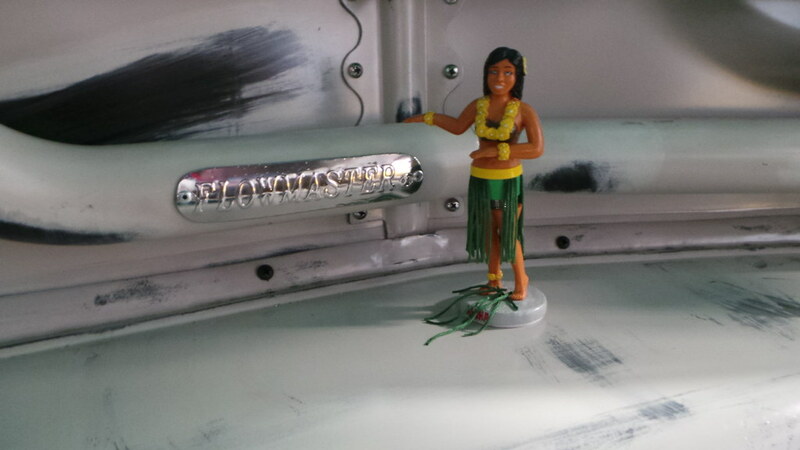 Perhaps this hula girl knows why. 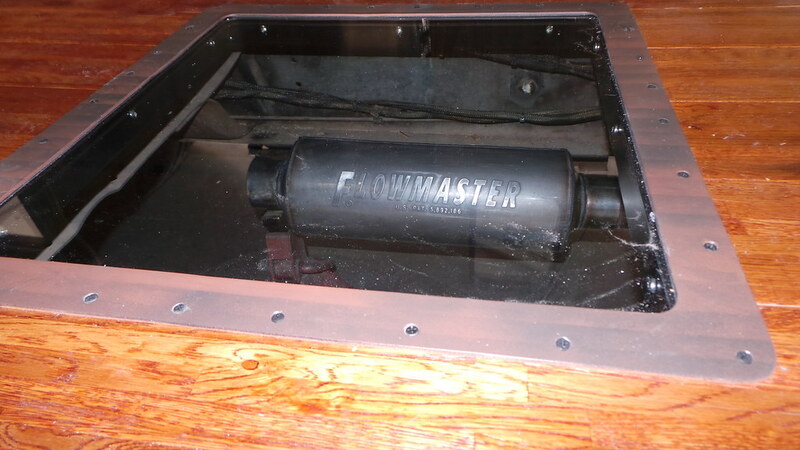 If you guessed the window was there to show off our custom Flowmaster exhaust, then you are absolutely correct. 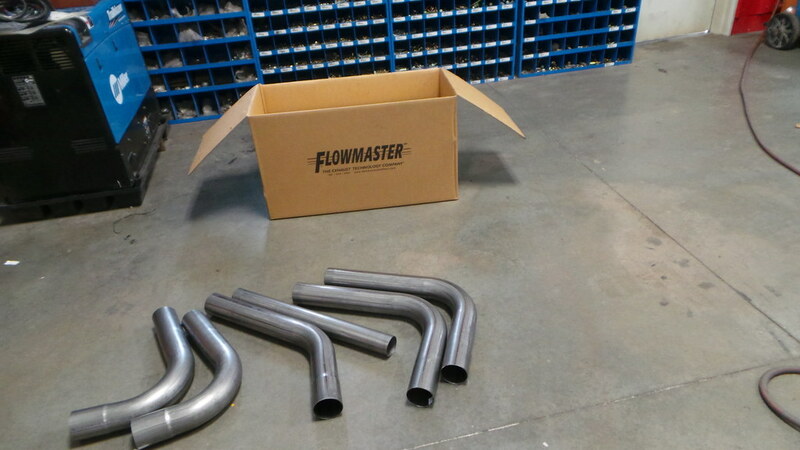 We used two of Flowmaster's new Laminar Flow mufflers with their Cool Shell technology to create an exhaust that sounds great, helps us get the most out of our Wegner Automotive LS engine, and doesn't radiate a lot of heat through the floor. 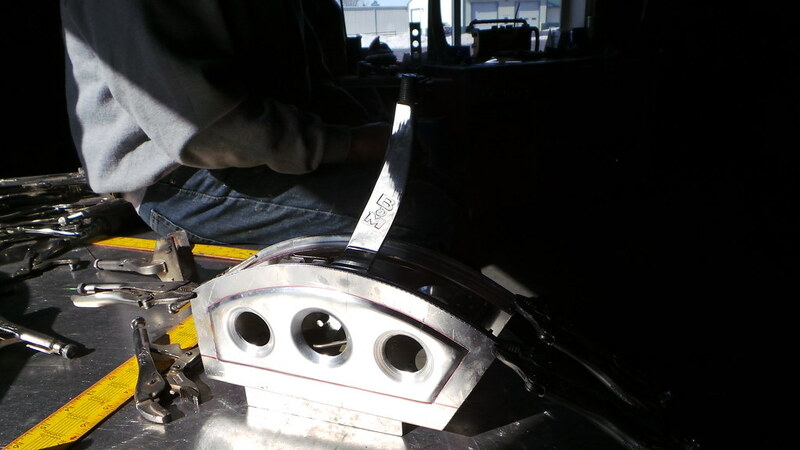 Next we turned our attention to a vital control that had yet to be installed in the Happy Camper's cockpit - the shifter. For this, we turned to B&M Racing and got one its Quicksilver automatic shifters and made a custom case to match the design of the rest of the cockpit. Our next big dilemma was deciding what to do about seating. 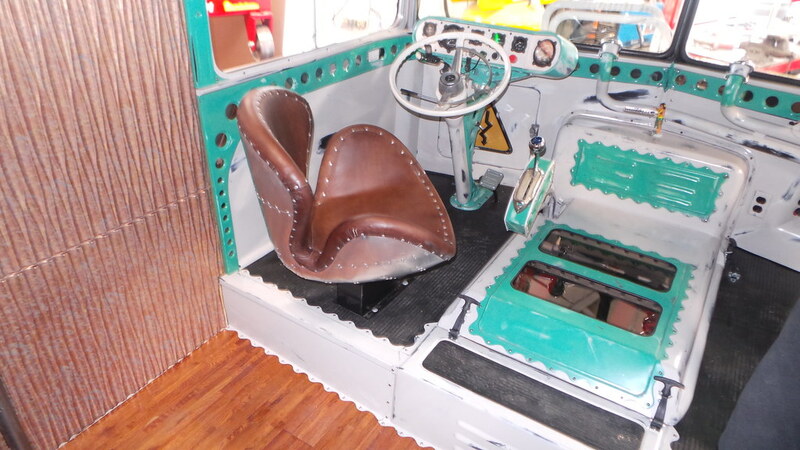 Racing seats would just look out of place in an RV and the stock Winnebago seats were out of the question. Luckily, Restoration Hardware had just the answer with their bomber-style seats. 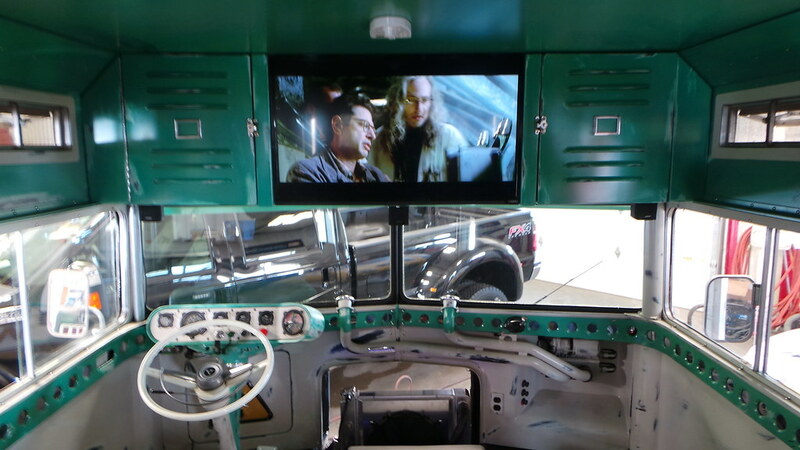 They were the perfect addition to our RV and really set off the WWII bomber theme of the cockpit. 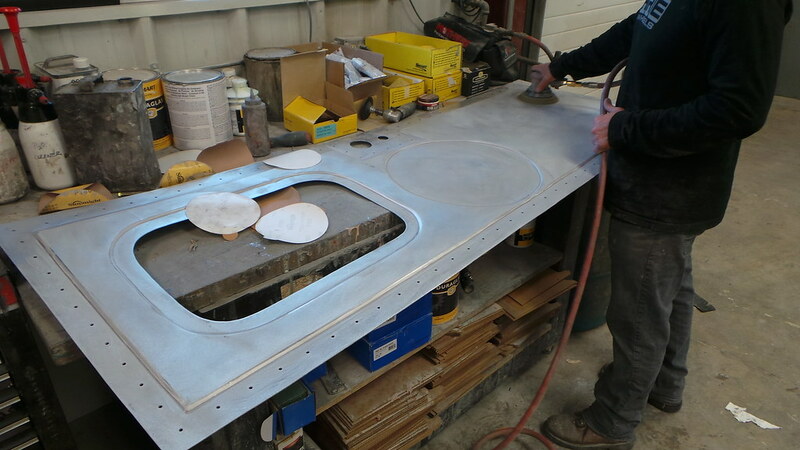 We then fabricated bases for the seats that allowed them to swivel around to face into the coach or lock in place for driving. 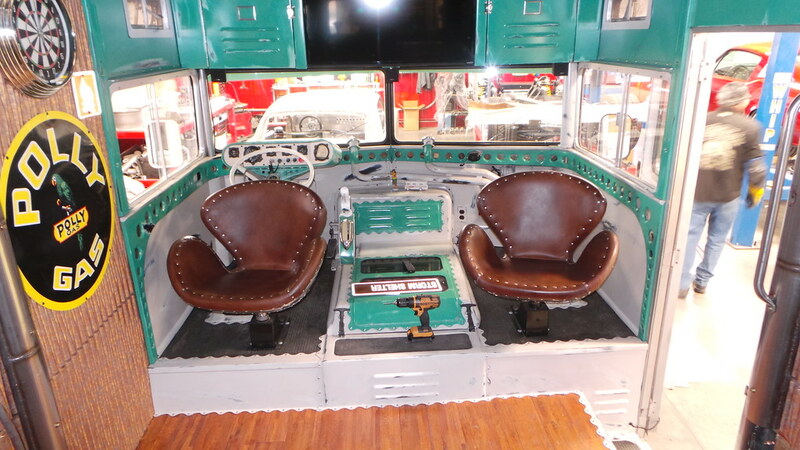 And yes, we did install seatbelts too. Now the fun would really begin as we turned our attention to the coach of the RV. 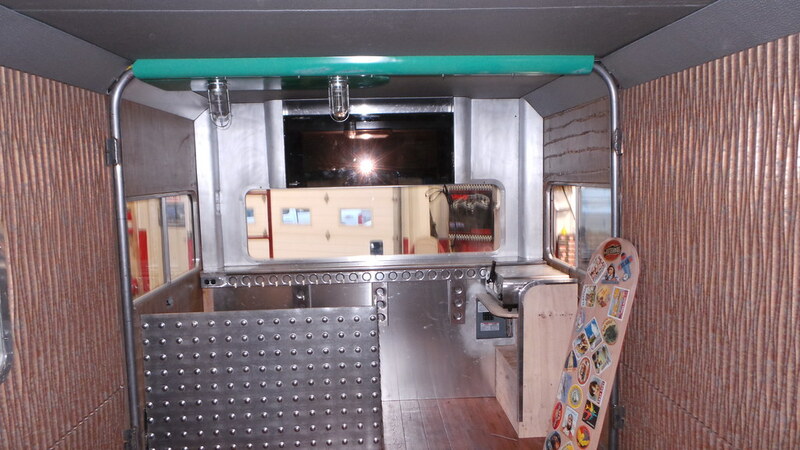 We wanted the Happy Camper to have everything you could ever want in a party wagon ... and more. 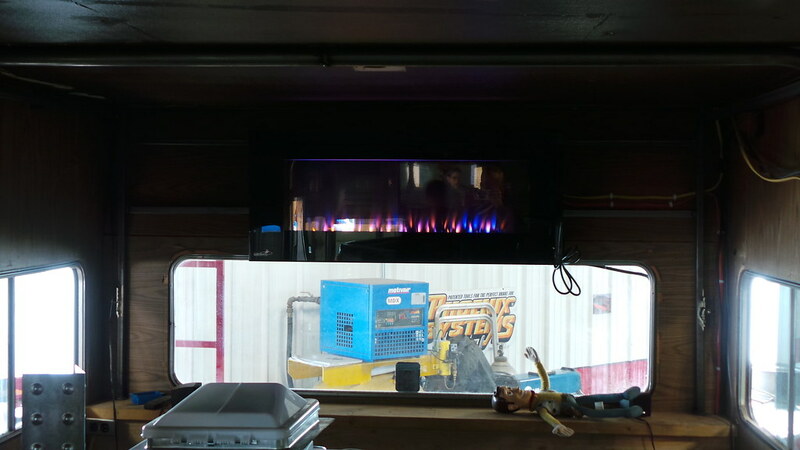 So we started by installing a (artificial) fireplace above the rear window. 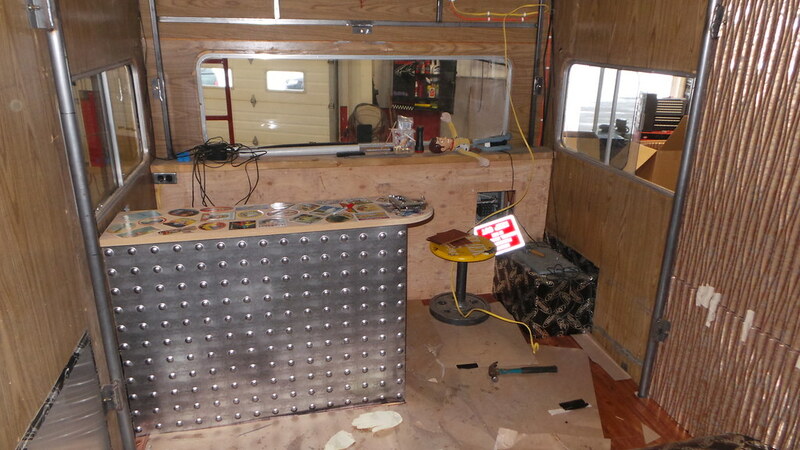 Next we built out the bar area and kitchen. 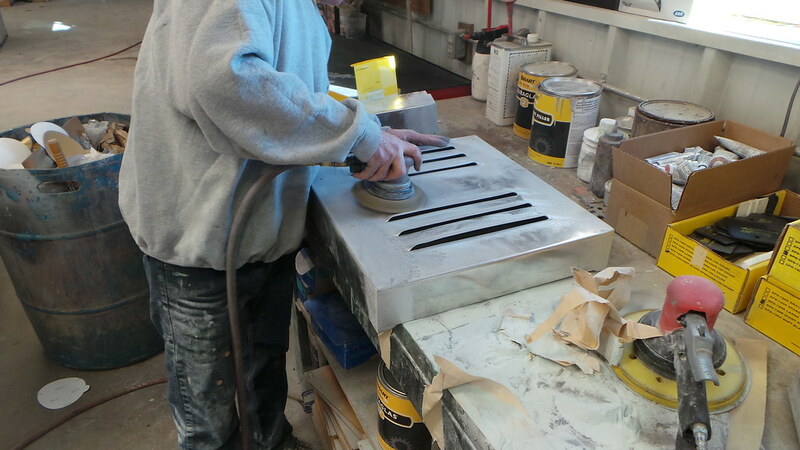 We then fabricated all of the metal skin for the cabinets, bar, and walls. 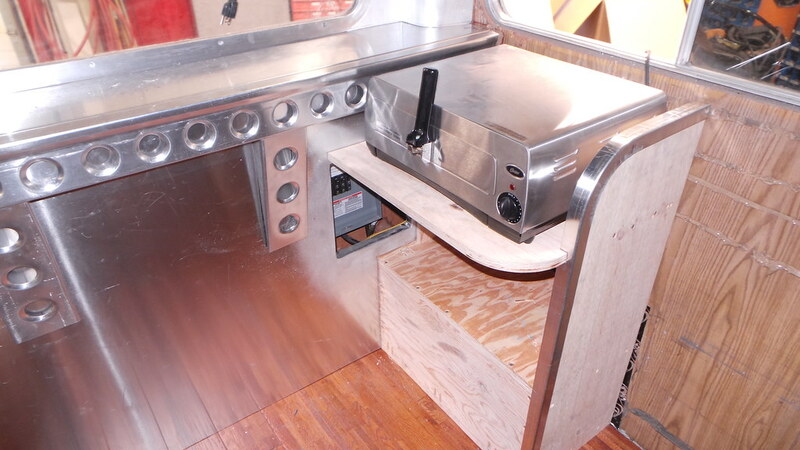 We then skinned the wheel wells to match the bar and installed the one and only cooking appliance needed inside any respectable RV - a pizza overn. 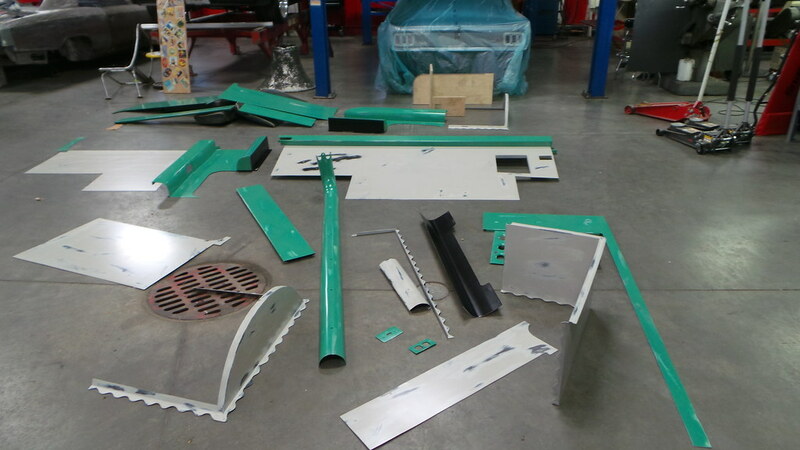 Next we pulled all of the interior pieces back out and took them into our Global Finishing Solutions Ringbrothers Performer paint booth to give them their distressed white and seafoam green paintjob. 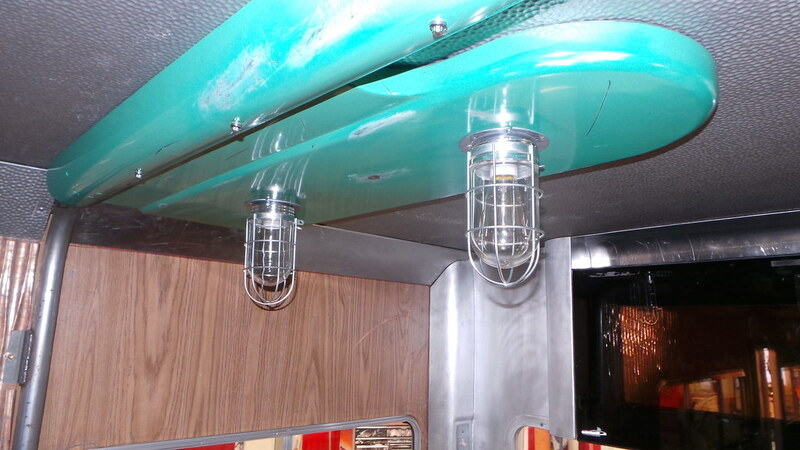 After reinstalling them, we added little accents like some industrial lighting and a heater to the back. 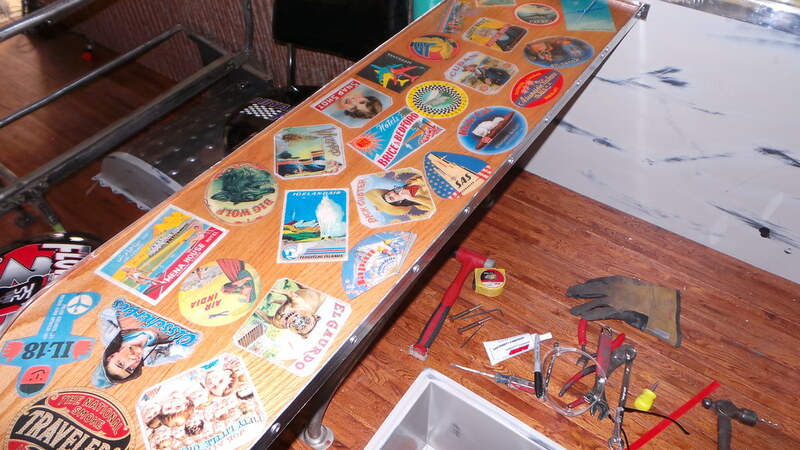 We then proceeded to continue decorating the back of the camper with all sorts of bric-a-brac that really lets people know that this camper is all about having a good time. In the first photo you can also see the frames to the benches that we are building to make sure there is plenty of seating inside. 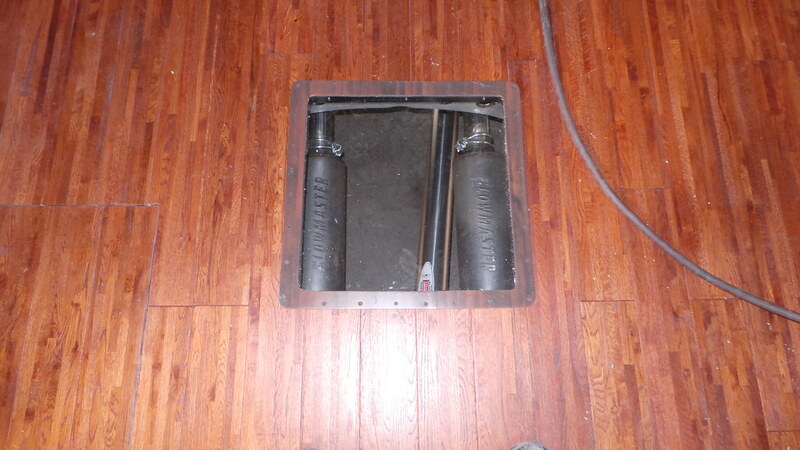 We also got the camper's new driveshaft installed shich you can see run between our Flowmaster mufflers through the plexiglass window in the floor. But the fun doesn't stop when you leave the RV. Out back we have the Happy Camper Bar & Grill. 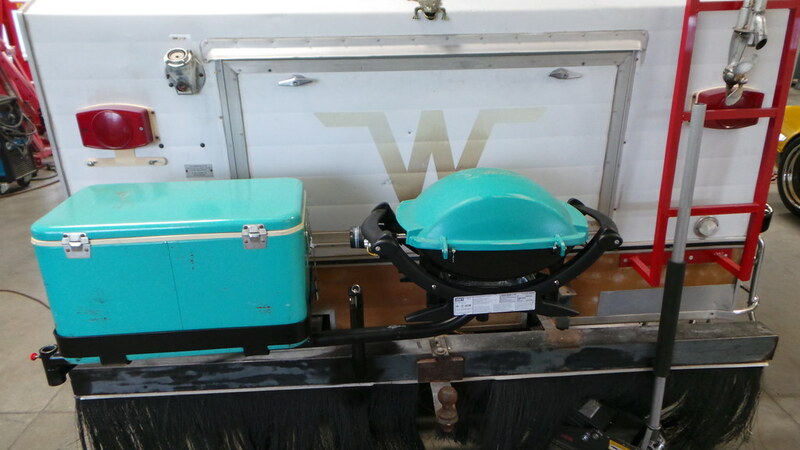 We fabricated a swinging arm to house both the gas BBQ as well as retain our vintage cooler, both painted in seafoam green to match the interior. 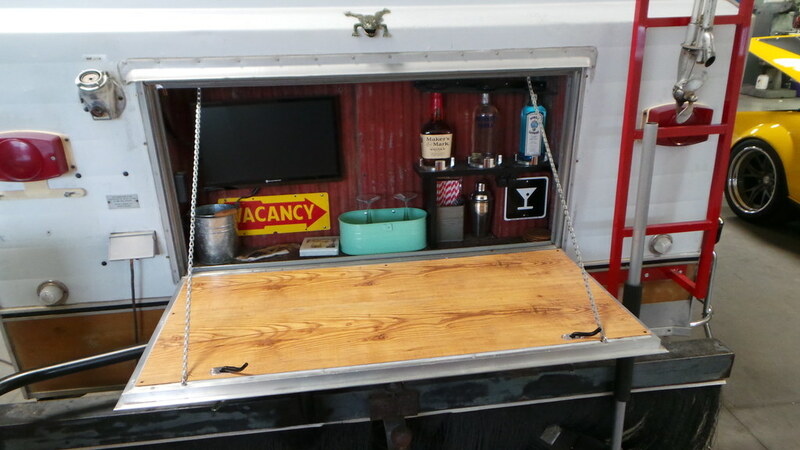 Swing the grill and cooler into position and open the rear storage compartment and you will find a fully stocked bar with its own small TV, so when you are out back BBQing up some burgers and mixing drinks you won't miss a minute of your favorite game or racing event on TV. 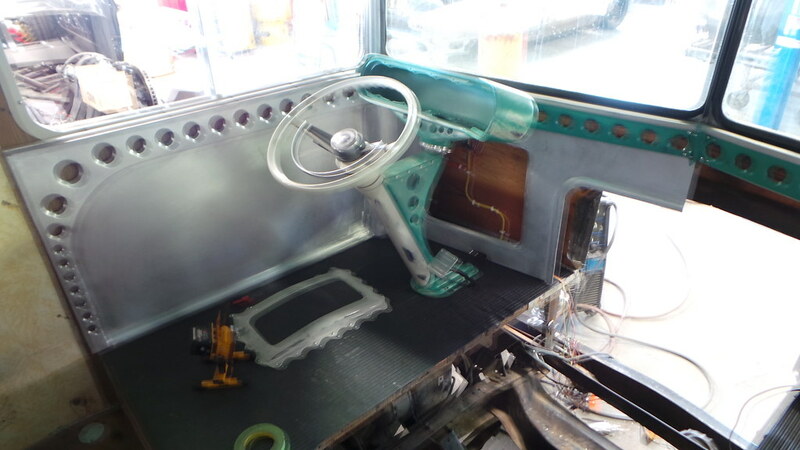 We have lots more going on with the build so make sure to stay tuned to our blog for Part 5 which will include the Happy Camper's completely finished interior, first outing, and three crazy days on the 2014 Hot Rod Power Tour.